Imagine it for a second: just lazily swimming among the java moss without a care in the world. No worries, no places to be, no taxes? Yep, there’s no doubt that pet fish are living the good life. While you (sadly) can’t actually shed your human responsibilities completely, admiring a beautiful fish tank is the next best thing. So, here’s our top five list of best aquariums that will make you wish you were a fish! A perfect fish tank for your living room! 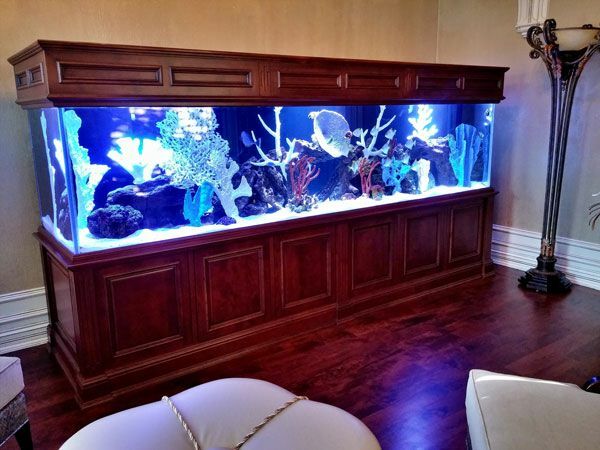 First and foremost, this sunning, 120-gallon reef aquarium is guaranteed to be the talk of the town! Also, with plenty of space for all sorts of vibrant saltwater plants, your fish will feel right at home. This catch of an aquarium creates instant atmosphere. Next, at a whopping 11-ft long and 600 gallons, this saltwater community tank is impossible to miss. Definitely, it makes a bold statement with beautiful hardwood which adds a touch of warmth to any space. Who knows? You just might be tempted to ditch your current digs and dive into the fish life. It really is that good! Who says you have to go to the coast to enjoy the ocean? How would you like to get the seaside experience without ever leaving the suburbs of Chicago? 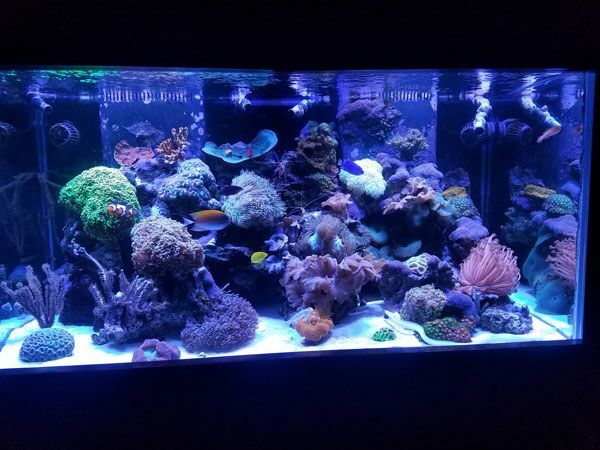 While the saltwater breezes might be left to the imagination, this unique 900-gallon tank gives you a taste of the beach. Furthermore, with its attached pond, you can walk right up like you’re looking out over the ocean! Cozy cherry wood corner fish tanks. These two corner tanks make quite the striking pair. 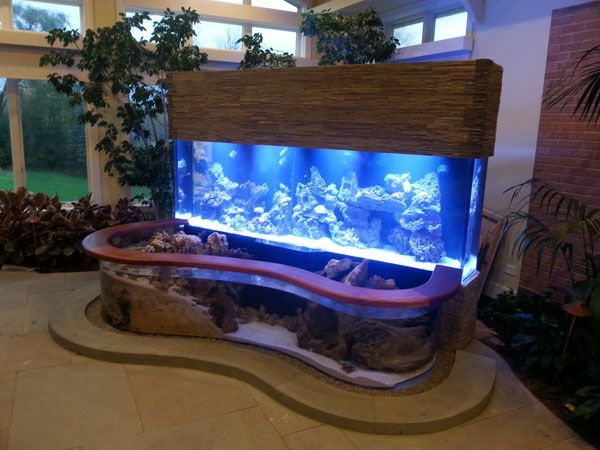 With one a peaceful reef tank and the other designed to hold saltwater predators, they offer an intriguing contrast. Also, made of rich cherry wood and holding 150 gallons each, it’s easy to be mesmerized by their serene beauty. 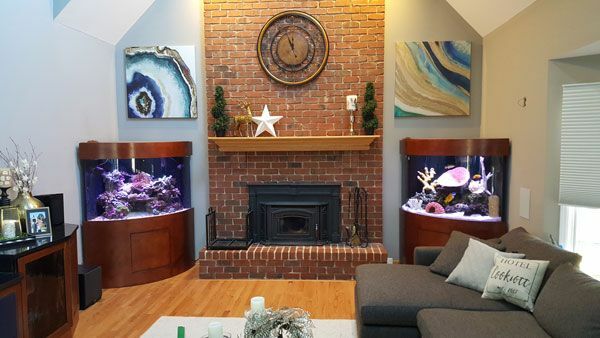 Certainly, we're just a tiny bit jealous of the owners of these tanks! 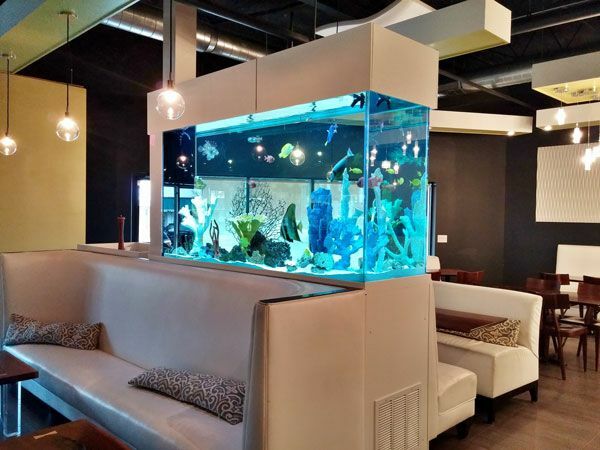 Restaurant-goers get to enjoy the beauty of this tank. Finally, housed by one lucky restaurant in Winnetka, Illinois, this 400-gallon tank offers guests stunning 360-views of its saltwater life. Most noteworthy, no matter where you’re seated, you can admire it from all angles!